It's not a meter pe se, but it's a flash calculator and a step-above the simple cardboard wheels, so I thought I'd add it here. 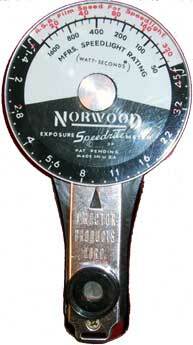 It's the sister to the Norwood Director Flashrite, which was designed to be used with bulbs. This one is meant for electronic flash. Both the Flashrite and Speedrites work on the novel idea of incorporating an actual rangefinder tool with a calculator. When you have to manually set up a flash, you need to know the camera sync speed, the guide number for your flash, and the distance between your flash and the subject. If you know those, you can compute the f/stop for your lens. Since most cameras at this time (early 50s) didn't have rangefinders, this tool made it a little easier to figure it out. Unlike the Flashrite, which takes some work to set up and use, this one can be figured out without instructions. You read the manufacturer's rating in watt-seconds, match it against the ASA if your film, and then use the rangefinder to figure the distance, then read the f/stop directly against the pointer. Easy. Tougher to use it today, though, since modern equipment isn't typically rated in watt-seconds (not in my literature, anyway). But it's a neat idea anyway.